Cubo cek pahe.in website e. Itu ciek nan mbo ikuik an kini update2 film nyo jo mkvcage tu. Tapi ndak ado duo film angelopoulos nan ang cari mbo cek ptg. Kalau ndak namuah ang manunggu stek agak bara hari bia mbo cubo request an di kaskus teather. Yang landscape the mist lah mbo apuih. The travelling player nan ado nyoh. Ndak rancak resolusi e.
The book will be open. Don't be shy and tell me that it's true. nay, tis just the essence of the otaku at work, y'know how passionate dorks can go on and on about the things they like, I was going to write more but I decided it started to look overwhelming so I decided against. It's gonna take a while for me to get into scholar level like you, though, that's for sure. I don't see myself anything near as that, I'm lazy to read some of the written works which goes more in depth into the characters, been a long time since I've meaning to read em and I'm sure I'm going to read the joke Alternative Facts in Eastern Utopia book (which is an parody to the whole fake news stuff that was happening) before any other more serious one because it sounds meme-y. I feel you, despise me getting into Touhou I feel overwhelmed by the idea of getting into stuff like Kantai Collection or the Fate series. I remember when I started getting into the series, I think my entry way were crossover doujinshi, because I had read a Hidamari Sketch x Death Note one and I wanted more stuff like that. I saw that there were a lot of doujin that crossed over with touhou and despise me not understanding well I was having a blast, and it was all downhill from there. I think most of my passion towards the series don't really come from liking the series directly, mostly of the culture surrounding it I barely ever play games touhou included lol wew. And my passion for manga intertwines greatly with the creation of Doujinshi, there's a lot of wonderful artists that I'd never learn about if not for this series, and lots of wonderful artists that I'd never have a chance to learn about it since they never did anything besides touhou doujinshi. I'm not much of a believer of trying to treat learning about a series as homework so I wouldn't exert myself on that but if you're interested in learning about the series I'd recommend starting throught learning about the sixth game of the series: Embodiment of Scarlet Devil (EoSD). It's the first Touhou Windows game and it has the most popular cast of the series. 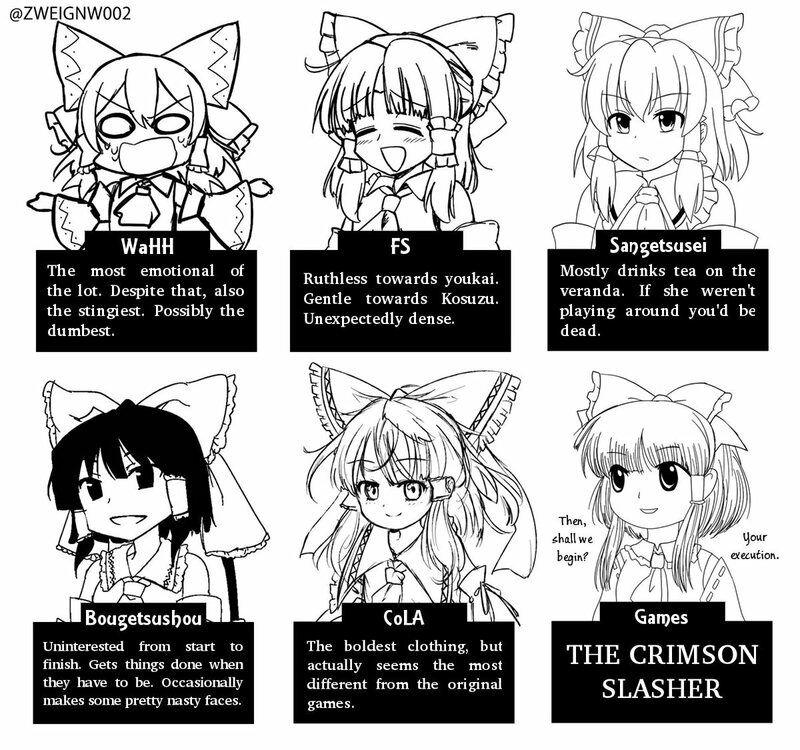 Koakuma is in it and naturally, Reimu as well. Every game kinda works like this: "There is something strange... in the neighborhood, who you gonna call? Youkai busters"
Or if you're not interested on the lore of a game in specific you could just eventually look at a character's design and think "o I want to learn more about this character" and read their page on the Touhou Wiki, I'm sure I did that a ton, naturally you get to learn their relationships with other characters as well. Regarding fan content tho, you shoudn't take canonicity as law, most of the fanbase respects and indulges on the idea of a very transformative reality on their on creations, so it's very common to see the same characters being portrayed as extremely different entities by different people (even in canon they might difer). 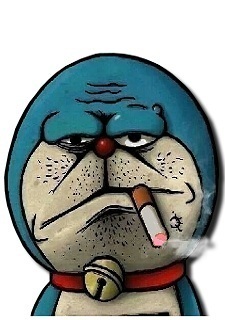 Having a basis throught canon knowledge is nice but sometimes it might make sense and other times not. I might've written more than I should but if you going throught games in order (of the windows era games) to familiarize yourself with the characters and the setting isn't such a bad idea if you feel lost. As soon as you feel more confortable the rest should come in in a swoop. If you wonder what the games marked as decimals are, they're just games that leave the norm of the usual bullet hells, some which are fighting games created in collaboration with another game studio but also canon. You talk about natural disasters like it's an everyday thing. Have you been struck by one before? Oi. Biaso, mode tu jo nyo. ang baa cok. Dma ang kni ko? What about you? How things are in Indonesia? Sama-sama :) Yang penting tetep waspada. Baru nemu lagi artikelnya. http://time.com/5031607/earthquake-predictions-2018/ Awalnya gak gitu gubris artikel ini karena sekilas bukan dari jurnal penelitian atau sejenisnya. Yang dibahas umum. Iya sejauh ini gempa yang paling banyak korban tahun ini baru di sini aja. Baik. Saya domisili Depok. Pernah travelling ke Sulsel sekali tapi belum pernah ke Sulteng. Gak punya kerabat juga di sana jadi gak tau kondisi persis skg. Waspada aja, jarang Indonesia kena gempa besar berkali-kali dlm waktu berdekatan begini. Tahun lalu emg pernah baca artikel (TIME kalau gk salah) kalau 2018 memang bakal banyak gempa. Pa kabar om? Ada gempa kah di Padang sana? Lagi gempa dimana-mana. Pantai Barat Sumatra rawan gempa kan?